Once you’ve revealed one of these, hold down the Shift key to toggle another (or to hide another one already displayed). This keeps only what you need in front of you. A 3D layer reveals four individual properties under Rotation to allow full animation on all axes. Add the Alt (Opt) to each of these one-letter shortcuts to add the first keyframe; once there’s one keyframe, any adjustments to that property at any other frame generate another keyframe automatically. V activates the Selection tool, which also moves and scales in a view panel. Y switches to the Pan-Behind tool, which moves the anchor point. W is for “wotate”—it adjusts Rotation. Quite the sense of humor on that After Effects team. Once you adjust with any of these tools, an Add Keyframe option for the corresponding property appears under the Animation menu, so you can set the first keyframe without touching the Timeline panel at all. The project 02_bouncing_ball.aep in the accompanying disc’s examples folder contains a simple animation, bouncing ball 2d, which can be created from scratch; you can also see the steps below as individual numbered compositions. To enable the Graph Editor, click its icon in the Timeline panel or use the shortcut Shift+F3. Below the grid that appears in place of the layer stack are the Graph Editor controls (Figure 1). Figure 1. The Graph Editor is enabled in the Timeline panel instead of default Layer view. There is no option to see them together. To work in the Graph Editor without worrying about what is selected, disable Show Selected Properties and enable the other two. Show Selected Properties displays whatever animation property names are highlighted. Show Animated Properties shows everything with keyframes or expressions. Show Graph Editor Set displays properties with the Graph Editor Set toggle enabled. Show Selected Properties is the easiest to use, but Show Graph Editor Set gives you the greatest control. You decide which curves need to appear, activate their Graph Editor Set toggle, and after that it no longer matters whether you keep them selected. The other recommended change prior to working through this section is to enable Default Spatial Interpolation to Linear in Preferences > General (Ctrl+Alt+; or Cmd+Opt+;). Try this if your initial animation doesn’t seem to match that shown in Figure 3. Figure 2. The layer travels across the frame like a bouncing ball, going up and down. To begin the bouncing ball animation, include Position in the Graph Editor Set by toggling its icon . Alt+P (Opt+P) sets the first Position keyframe at frame 0; after that, any changes to Position are automatically keyframed. Figure 2 shows the first step: a very basic animation blocked in using Linear keyframes, evenly spaced. It won’t look like a bouncing ball yet, but it’s a typical way to start when animating, for new and experienced animators alike. 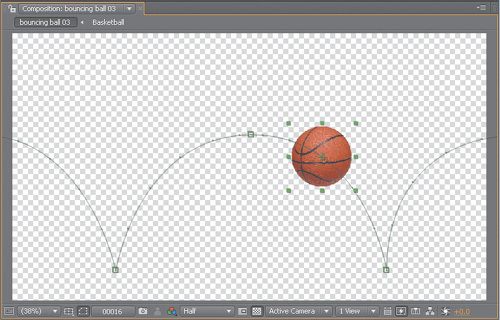 Having set the first keyframe at frame 0, move the ball off the left of the frame. At frame 24, move the ball off the right of the frame, creating a second keyframe. Create a keyframe at frame 12 (just check the box, don’t change any settings). Now add the bounces: At frames 6 and 18 move the ball straight downward so it touches the bottom of the frame. This leaves five Position keyframes and an extremely unconvincing-looking bouncing ball animation. Great—it always helps to get something blocked in so you can clearly see what’s wrong. Also, the default Graph Editor view at this point is not very helpful, because it displays the speed graph, and the speed of the layer is completely steady at this point—deliberately so, in fact. To get the view shown in Figure 2, make sure Show Reference Graph is enabled in the Graph Options menu . This is a toggle even advanced users miss, although it is now on by default. In addition to the not-very-helpful speed graph you now see the value graph in its X (red) and Y (green) values. However, the green values appear upside-down! This is the flipped After Effects Y axis in action; 0 is at the top of frame so that 0,0 is in the top-left corner, as it has been since After Effects 1.0, long before 3D animation was even contemplated. Auto Select Graph Type selects speed graphs for spatial properties and value graphs for all others. The simplest way to “fix” an animation that looks too stiff like this is often to add eases. For this purpose After Effects offers the automated Easy Ease functions, although you can also create or adjust eases by hand in the Graph Editor. Mac users beware: The F9 key is used by the system for the Exposé feature, revealing all open panels in all applications. You can change or disable this feature in System Preferences > Dashboard & Exposé. Select all of the “up” keyframes—the first, third, and fifth—and click Easy Ease (F9). When a ball bounces, it slows at the top of each arc, and Easy Ease adds that arc to the pace; what was a flat-line speed graph now is a series of arcing curves (Figure 3). Figure 3. 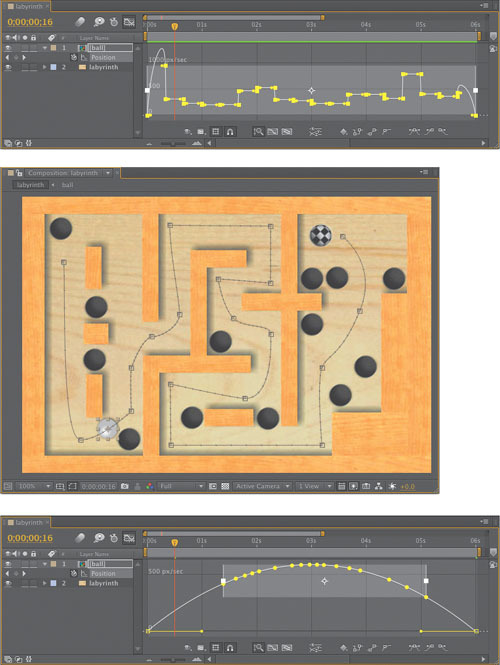 Easy Ease is applied (top) to the mid-air keyframes; Layer view (bottom) also shows the change from linear to Bezier with a changed keyframe icon. Technically, you could have applied Easy Ease Out (Ctrl+Shift+F9/Cmd+Shift+F9) to the first keyframe and Easy Ease In (Shift+F9) to the final one, because the ease in each case only goes in one direction. The “in” and “out” versions of Easy Ease are specifically for cases where there are other adjacent keyframes and the ease should only go in one direction (you’ll see one in a moment). In this case it’s not really necessary. Deselect all keyframes but leave the layer selected. Make sure the animation path is displayed (Ctrl+Shift+H/Cmd+Shift+H toggles). Click on the first keyframe in the Composition viewer to select it; it should change from hollow to solid in appearance. Switch to the Pen tool with the G key; in the Composition viewer, drag from the highlighted keyframe to the right, creating a horizontal Bezier handle. Stop before crossing the second keyframe. Do the same for the third and fifth keyframes (dragging left for the fifth). The animation path now looks more like you’d expect a ball to bounce (Figure 4). Preview the animation, however, and you’ll notice that the ball crudely pogos across the frame instead of bouncing naturally. Why is that? Figure 4. You can tell from the graph that this is closer to how a bouncing ball would look over time. You can use Ctrl+Shift+H (Cmd+Shift+H) to show and hide the animation path, or you can look in the Composition panel menu > View Options > Layer Controls. The Graph Editor reveals the problem. The red X graph shows an unsteady horizontal motion due to the eases. The problem is that the eases should be applied only to the vertical Y dimension, whereas the X animation travels at a constant rate. New to After Effects CS4 was the ability to animate X and Y (or, in 3D, X, Y, and Z) animation curves separately. This allows you to add keyframes for one dimension only at a given point in time, or to add keyframes in one dimension at a time. Disable the Graph Editor Set toggle for Y Position so that only the red X Position graph is displayed. Select the middle three X Position keyframes—you can draw a selection box around them—and delete them. Select the two remaining X keyframes and click the Convert Selected Keyframes to Linear button . Now take a look in the Composition viewer—the motion is back to linear, although the temporal eases remain on the Y axis. Not only that, but you cannot redraw them as you did before; enabling Separate Dimensions removes this ability. Instead, you can create them in the Graph Editor itself. Enable the Graph Editor Set toggle for Y Position, so both dimensions are once again displayed. Select the middle Y Position keyframe, and you’ll notice two small handles protruding to its left and right. Drag each of these out, holding the Shift key if necessary to keep them flat, and notice the corresponding change in the Composition viewer (Figure 5). Figure 5. If Separate Dimensions is activated, pull out the handles to create the motion arcs right in the Graph Editor; the handles are no longer adjustable in the Composition viewer. Show Graph Tool Tips displays values of whatever curve is under the mouse at that exact point in time. Select the first and last Y Position keyframes and click Easy Ease; the handles move outward from each keyframe without affecting the X Position keyframes. Drag the handles of the first and last Y Position keyframes as far as they will go (right up to the succeeding and preceding keyframes, respectively). Separate Dimensions does not play nicely with eases and cannot easily be round-tripped back, so unfortunately you’re best to reserve it for occasions when you really need it. Preview the result and you’ll see that you now have the beginnings of an actual bouncing ball animation; it’s just a little bit too regular and even, so from here you give it your own organic touch. The transform box lets you edit keyframe values in all kinds of tricky or even wacky ways. Toggle on Show Transform Box and select more than one keyframe, and a white box with vertices surrounds the selected frames. Drag the handle at the right side to the left or right to change overall timing; the keyframes remain proportionally arranged. There is a whole menu of options to show items that you might think are only in Layer view: layer In/Out points, audio waveforms, layer markers, and expressions. The Snap button snaps to virtually every visible marker, but not—snap!—to whole frame values if Allow Keyframes Between Frames is on . Figure 6. How do you do that? Add the Alt (Opt) key when dragging a corner of the transform box; this adjustment diminishes the height of the ball bounces proportionally over time. If you Ctrl+Alt-drag (Cmd+Opt-drag) on a corner that will taper values at one end, and if you Ctrl+Alt+ Shift-drag (Cmd+Opt+Shift-drag) on a corner, it will skew that end of the box up or down. I don’t do that kind of stuff much, but with a lot of keyframes to scale proportionally, it’s a good one to keep in your back pocket. At this point you may have a fairly realistic-looking bouncing ball; maybe you added a little Rotation animation so the ball spins forward as it bounces, or maybe you’ve hand-adjusted the timing or position keys to give them that extra little organic unevenness. Hold keyframes won’t help improve this animation, but you could use them to go all Matrix-like with it, stopping the ball mid-arc before continuing the action. A Hold keyframe (Ctrl+Alt+H/Cmd+Shift+H) prevents any change to a value until the next keyframe. Drag all keyframes from the one at the top of the middle arc forward in time a second or two. Copy and paste that mid-arc keyframe (adding one for any other animated properties or dimensions at that point in time) back to the original keyframe location, and toggle it to a Hold keyframe (Figure 7). Figure 7. 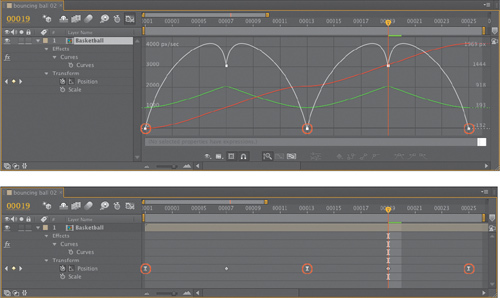 Where the graph line is flatlined, the bounce stops mid-air—the result of Hold keyframes, which have the benefit of ensuring no animation whatsoever occurs until the next keyframe. You can control a Bezier motion path in the Composition viewer using the Pen tool. Realistic motion often requires that you shape the motion path Beziers and add temporal eases; the two actions are performed independently on any given keyframe, and in two different places (in the viewer and Timeline panel). Animation can get a little trickier in 3D, but the same basic rules apply . Three preset keyframe transition types are available, each with a shortcut at the bottom of the Graph Editor: Hold , Linear , and Auto Bezier . Adjust the handles or apply Easy Ease and the preset becomes a custom Bezier shape. Copy a set of keyframes from After Effects and paste them into an Excel spreadsheet or even an ordinary text editor, and behold the After Effects keyframe format, ready for hacking. You can paste from one property to another, so long as the format matches (the units and number of parameters). Copy the source, highlight the target, and paste. You can use an Excel spreadsheet to reformat underlying keyframe data from other applications; just paste in After Effects data to see how it’s formatted, and then massage the other data to match that format (if you have Excel skills, so much the better). Once done, copy and paste the data back into After Effects. Keyframes respect the position of the current time indicator; the first frame is always pasted at the current time (useful for relocating timing, but occasionally an unpleasant surprise). There’s a lock on the Effect Controls tab to keep a panel forward even when you select another layer to paste to it. Copy and paste keyframes from an effect that isn’t applied to the target, and that effect is added along with its keyframes. Sometimes an animation must follow an exact path, hitting precise points, but progress steadily, with no variation in the rate of travel. This is the situation for which Roving keyframes were devised. Figure 8 shows a before-and-after view of a Roving keyframe; the path of the animation is identical, but the keyframes proceed at a steady rate. Figure 8. Compare this graph with the one in Figure 3 (top); the speed graph is back to a flat-line because the animation runs at a uniform pace. You may not want to bounce a ball, but the technique works with any complex animation, and it maintains eases on the start and end frame. Pay close attention to the current time and what is selected when copying, in particular, and when pasting animation data. By no means, then, does the Graph Editor make Layer view obsolete; Layer view is still where the majority of compositing and simple animation is accomplished. You must enable Allow Keyframes Between Frames in the Graph Editor or they all snap to exact frame increments. However, when you scale a set of keyframes using the transform box, keyframes will often fall in between frames whether or not this option is enabled.